Ruff at Columbia Beach: Ralph Hocken Photo. find a local birder to go birdwatching with. The Sunday Bird Walk went to Buttertubs Marsh in Nanaimo. Among the highlights were the sightings of a Willow Flycatcher, three Anna's Hummingbirds, a large flock of Bushtits, a large numbers of Cedar Waxwings, a Red-tailed Hawk, a Merlin and a Cooper's Hawk. Canada Geese, Wood Duck, Mallard, Green -winged Teal, American Wigeon, Ring-necked Duck, Hooded Merganser, Pied-billed Grebe, American Coots, Great Blue Heron, Cooper's Hawk, Red-tailed Hawk, Merlin, Turkey Vulture, Rock Pigeon, Band-tailed Hawk, Belted Kingfisher, Anna's Hummingbird, Northern Flicker, Northwestern Crow, Common Raven, Swallow-sp, Chestnut-backed Chickadee, Brown Creeper, Bushtit, Bewick's Wren, Marsh Wren, American Robin, Common Yellowthroat, Cedar Waxwing, Red-wing Blackbird, Spotted Towhee, Song Sparrow, House Finch, American Goldfinch and House Sparrow. 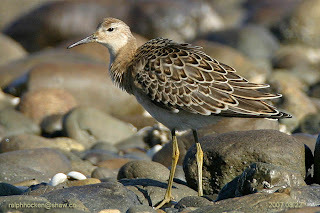 The Ruff was again seen at the Columbia Beach near the Pebble Beach Townhouses off Johnstone Road in Parksville. Four Whimbrel were seen near the gravel bar at Columbia Beach near the Pebble Beach Townhouses off Johnstone Road in Parksville. The Whimbrel nests in the Artic and migrates through this area. The Ruby-throated Hummingbird was again seen in a yard in Black Creek.
" Rare Bird Alert--Little Stint"
One Little Stint was seen, with a juvenile Sanderling and forty-five juvenile Western Sandpipers. along the beach near the residential area of Port Renfrew. Six Brown Pelicans, four Red Phalaropes, Red-necked Phalaropes, one Fork-tailed Storm-Petrel, Sabine's Gulls, many Sooty Shearwaters, Common Murres, Rhinoceros Auklets, Marbled Murrelets, one Pomarine Jaeger, one Parasitic Jaeger and three Cassin's Auklets were seen offshore at Botanical Beach. A Ruff has been seen at the Columbia Beach ponds near the Pebble Beach Townhouses off Johnstone Road in Parksville. The Ruff is normally found in Asia. It is a rare visitor to this area. A Ruby-throated Hummingbird is visiting a yard in Black Creek. The Hummingbird is feeding on flowers and is hawking insects in the yard. The Ruby-throated Hummingbird normally found east of the Rocky. Two female Evening Grosbeaks, with two fledglings, were visiting feeders along Munroe Road in the Jingle Pot area of Nanaimo. An Anna's Hummingbird, several Steller's Jays, Pileated, Hairy, Downey Woodpeckers and Northern Flicker were also seen at this location. A slide presentation on birds and wildlife. Monday September 22, 2008@ 7:30 pm. The Wednesday Morning Birdwalks are cancelled for the summer months and will resume in the fall. The Sunday Bird Walk on September 07, 2008 will be going to the Englishman River Estuary, Shelly Road, side in Parksville. Meet at the Bird Store at 9:00 A.M. or at the end of Shelly Road off Highway 19A (ocean side of highway 19A) at about 9:30 A.M.
ON JUGS, 20LB and 40LB BAGS OF BIRD SEED. Our seed sale only happens twice a year so come in and save on your birdseed! Purchase the birdseed you will use in the next few months at the sale price. Don’t worry about storage---just come by and pick up the seed you purchased as you need it, without the hassle of storing it! 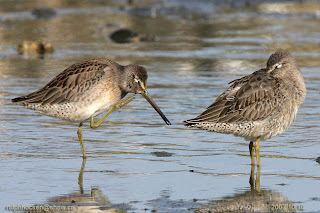 Long-billed Dowitchers: Ralph Hocken Photo. The Sunday Bird Walk went to Holden Creek in the mud and rain. Among the highlights were the sighting of several flocks of Long-billed Dowitchers and Western and Least Sandpipers that were all spooked by a Peregrine Falcon. A Red-tailed Hawk flew over and disappeared into the low lying clouds. Canada Goose, Common Mergangers, Green-winged Teal, Northern Pintail, Mallard, Great Blue Heron, Red-tailed Hawk, Peregrine Falcon, Barn Swallow, Violet-green Swallow, Killdeer, Least Sandpiper, Western Sandpiper, Long-billed Dowitchers, Common Raven, Brewer's Blackbird, European Starling, Song Sparrow and House Finch. Fifty Black Swifts, two Common Nighthawks and many Turkey Vultures were seen over Sooke.
" 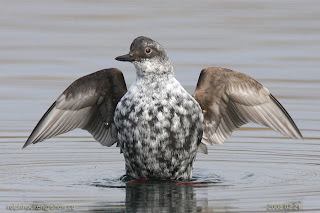 Rare Bird Alert-Manx Shearwater"
A Manx Shearwater was spotted close to shore at Port Renfrew. A little further off shore were large numbers of Sooty Shearwaters, an adult, light phase Long-tailed Jaeger, one Fork-tailed Storm-petrel, a few Red Phalaropes, a large flock of Red-necked Phalaropes, Common Murres, Rhinoceros Auklets, Pigeon Guillemots, Marbled Murrelets and three Brown Pelicans. Twenty-four Common Nighthawks, two Purple Martins, several Barn Swallows were seen over Sooke. Over fifty Sooty Shearwaters were seen close to shore near Jordon River. Four Purple Martins were seen above the 2500 block of Glenayr Drive in Nanaimo. Over twenty Sooty Shearwaters, several Pink-footed Shearwaters, a Buller's Shearwater, hundreds of Red-necked Phalaropes, a light phase Pomarine Jaeger, big flocks of Northern Pintails, Green-winged Teal, Common Murres, Rhinoceros Auklets, a Cassin's Auklet and two Brown Pelicans were seen from Otter Point on the west coast of Vancouver Island. Over twenty Black Swifts, large flocks of Steller's Jays and large numbers of Turkey Vultures were seen flying down the west coast from Port Renfrew to Sooke. Three Semipalmated Plovers were seen in with a mixed flock of Least, Western and Semipalmated Sandpipers on the mud flats at the Englishman River Estuary, Plummer Road side.
" Rare Bird Alert- South Polar Skua"
Two South Polar Skuas were seen close to shore at Botanical Beach near Port Renfrew. The South Polar Skua nest in the Antarctica. The juveniles undertake a regular migration into the north Pacific arriving off the coast of British Columbia in July and August.
" Rare Alert- Crested Caracara"
A Crested Caracara was photographed at Fort Fraser on the Yellowhead Highway, west of Prince George. The bird was following a farmer cutting hay on a field near Fort Fraser. The Crested Caracara was feeding on the mice being kicked up by the hay cutter. It was being mobbed by a flock of Common Ravens. The Crested Caracara is normally found in Central America in open savanna or desert and feeds mainly on carrion it locates by patrolling at low altitude. The bird has not been observed in that area since, and so has obviously moved on. Keep an eye out for it in your area! Several Steller's Jays were seen on Gabriolia Island. A Baird's Sandpiper, three Pectoral Sandpiper, three Greater Yellowlegs, Lesser Yellowlegs, Killdeer, Western Sandpipers, Least Sandpiper, Semi-palmated Sandpiper and Dowitchers were seen at Holden Creek in Cedar. A Merlin and a Cooper's Hawk were seen in the same area.
" Rare Bird Alert- Blue-winged Warbler"
A Blue-winged Warbler was sighted in Ucluelet. The bird was seen in an area behind Little Beach on the top of a tall Cedar Tree. It remained in the tree for several minutes. The Warbler had a blue-gray wings and a black eye line. The Blue-winged Warbler is usually found in the eastern United States, and in southern Ontario. Ten Cedar Waxwings and two Common Nighthawks were seen in this same area at Ucluelet. A Western Tanager was spotted in the 1700 block of Eglington Road in South Wellington. The Sunday Bird Walk on August 31, 2008 will be going to Buttertubs Marsh in Nanaimo. Meet at the Bird Store at 9:00 A.M. or at the parking area off Bowen Road at about 9:15 A.M. The Sunday Bird Walk went to Columbia Beach, at French Creek. Highlights included the sighting of eight Heermann's Gulls, California Gulls, Bonaparte's Gulls, a Ring-billed Gull and eleven Black Oystercatchers. Canada Goose, Double-crested Cormorant, Great Blue Heron, Mallard, Harlequin Duck, White-winged Scoter, Turkey Vulture, Bald Eagle, California Quail, Black-bellied Plover, Black Oystercatcher, Killdeer, Western Sandpiper, Least Sandpiper, Greater Yellowlegs, Pigeon Guillemot, Heermann's Gull, Bonaparte's Gull, Ring-billed Gull, California Gull, Glaucous-winged Gull, Rock Pigeon, Northern Flicker, European Starling , Northwestern Crow, Common Raven, Purple Martin, Chestnut-backed Chickadee, Bewick's Wren, Spotted Towhee, White-crowned Sparrow, Song Sparrow, House Finch, American Goldfinch. A Manx Shearwater was spotted offshore at Botanical Beach, near Port Renfrew on the west coast of Vancouver Island. The Shearwater came from inside the Juan de Fuca Strait and stayed close to shore before heading back out and up the Coastline. Manx Shearwaters are usually found on the east coast of Canada, but is a rare but regular visitor to the west coast of British Columbia. Two Black Throated Gray Warblers, a Western Tanager, a Black Headed Grosbeak, Warbling Vireos, and a Yellow Warbler were seen at Springwood Park in Parksville. A Barred Owl and Steller's Jays were seen in a yard along Benson View Road above the Jingle Pot area of Nanaimo. Steller's Jays are visiting feeders along Cloke Road in Ladysmith. Two female Harlequin Ducks were seen at Clark Bay on Gabriola Island. Two Purple Martins were spotted at Buckley Bay near the Ferry Terminal. Three Heermanns' Gulls and a Ring-billed Gull were seen in with the California and Glaucous-winged Gulls at Columbia Beach. A small flock of Purple Martins were singing and dancing in the sky above the 100 block of Meridian Way in Parksville. Five Least Sandpipers, eight Western Sandpipers, one Lesser Yellowlegs and four Greater Yellowlegs were seen at French Creek. Two Black Oystercatchers, several California Gulls and many Glaucous-winged Gulls were seen on a gravel bar at Columbia Beach. Sixteen Common Nighthawks were seen flying southwest over Sooke at sunset. Four Wilson's Warblers were spotted frolicking about on lily pads on a pond along Lancewood Avenue in Lantzville. Two adult and two Collared-Doves were seen in a yard in Sooke. Six Spotted Sandpipers, two Belted Kingfishers, a Great Blue Heron were seen at Sunset Beach in Neck Point Park in Nanaimo. Three Great Horned Owls were seen at Neck Point Park in Nanaimo. The Wednesday morning Birdwalk in Parksville will resume in the fall. The Sunday Bird Walk on August 24, 2008 will be going to the Nanaimo River Estuary in south Nanaimo. .
Meet at the Bird Store at 9:00 A.M. or at the parking area at the end of Raines Road at about 9:30 A.M.
FOR THAT BUSY WINTER BIRD FEEDING! The Sunday Bird Walk went to the Englishman River Estuary, Plummer Road side in Parksville, the highlights included a flock of Black Swifts and Vaux's Swifts circling above us hawking insects. Two Sharp-shinned Hawks flew above us, gliding in big circles. Two Merlins put in a brief appearance and disappeared behind some fir trees. A mixed flock of Least Sandpipers, Western Sandpipers and one Sanderling kept us comparing the different species on the mud flats. A mixed flock of migrating Swallows flew over us heading south down the Strait of Georgia. Canada Goose, Mallard, Scoter-SP, Common Merganser, Double-crested Cormorant, Great Blue Heron, Marbled Murrelet, Bald Eagle, Sharp-shinned Hawk, Merlin, Turkey Vulture, Killdeer, Sanderling, Least Sandpiper, Western Sandpiper, Spotted Sandpiper, Lesser Yellowlegs, Black Oystercatcher, California Gull, Glaucous-winged Gull, Bonaparte's Gull, Pigeon Guillemot, Belted Kingfisher, Black Swift, Vaux's Swift, Violet-green Swallow, Tree Swallow, Rough-winged Swallow, Barn Swallow, Cliff Swallow,Northern Flicker, Northwestern Crow, Red-breasted Nuthatch, American Robin, Swainson's Thrush, European Starling, Spotted Towhee, White-crowned Sparrow, Red Crossbill, House Finch and American Goldfinch. A Rose-breasted Grosbeak was seen sitting on a wire in Port Renfrew. The Rose-Breasted Grosbeak is usually found east of the Rockies. Twelve Sooty Shearwaters, a Tufted Puffin, Cassin's Auklet, several Red-necked Phalaropes and two Caspian Terns were seen offshore at Port Renfrew. One Wandering Tattler, one Surfbird and several Black Turnstones were seen at Botanical Beach. An Immature Brown Pelican was seen offshore at Jordon River on the west coast of Vancouver Island. Three Heermann's Gulls were seen about one half a mile off Blandon Point, offshore from Lantzville. An Anna's Hummingbird is visiting feeders along Boundary Crescent in Nanaimo. Several Common Nighthawks were seen over the Englishman River Estuary, Plummer Road side in Parksville. Several Nighthawks have been seen flying above Departure Bay in Nanaimo. A Great Horned Owl was seen at Neck Point Park in Nanaimo. The Owl was seen on the right of the path that leads to Sunset Beach. "Rare Bird Alert--Black and White Warbler"
A Black and White Warbler was seen at the Beaver Pond in Morrell Wildlife Sanctuary in Nanaimo. The Warbler was moving down a tree trunk, like a Red-breasted Nuthatch. The Warbler was striped on its back, the face/head stripes were narrow. The Black and White Warbler is usually found east of the Rockies. An Olive-sided Flycatcher was seen perched on the top of one of the tall dead trees in the Beaver Pond at Morrell Wildlife Sanctuary in Nanaimo. A Barred Owl was seen at Colliery Dam in Nanaimo. A Great Horned Owl was seen near Bonnel Creek in Nanoose Bay. Two Green Herons were seen roosting near the gazebo at Tomatoes Restaurant in Courtney. A Humpbacked Whale was photographed near Schooner Cove in Nanoose Bay during the Sunday bird walk. A Solitary Sandpiper was spotted along the Sooke River in Sooke. Red-necked Phalaropes were seen offshore at Jordan River. Along the Jordan River bank were large numbers of Western Sandpipers and Least Sandpipers. Western Sandpipers and Least Sandpipers and a juvenile Whimbrel were seen on the beach at Jordan River. Western, Least and Semipalmated Sandpipers were seen at French Beach. Sanderlings, Black Turnstones, Semipalmated Sandpipers, Western Sandpipers, Least Sandpipers, Semipalmated Plovers and Long-billed Dowitchers were seen at Whiffin Spit. The Sunday Bird Walk on August 17, 2008 will be going to Columbia Beach. The Sunday Bird Walk went to Neck Point Park in Nanaimo. Among the highlights were four sightings of Great Horned Owls perched in tall trees. We saw one Great Horned Owl when we started out on the walk and near the end of the walk we found three on another trail. At Sunset Beach where there is usually just one, we found four Spotted Sandpipers. We saw a line of ten Brandt's Cormorants in single file, just above the water heading into the strong westerly wind. On the water, further out towards Schooner Cove, we saw Whale spouts several times. Eleven birders found the following twenty-eight species of birds: Double-crested Cormorant, Pelagic Cormorant, Brandt's Cormorant, Turkey Vulture,BaldEagleGreatHorned Owl, SpottedSandpiper, California Gull, Glaucous-winged Gull, Caspian Tern, Rufous Hummingbird, Northern Flicker, Downy Woodpecker, Pacific-slope Flycatcher, Northwestern Crow, Common Raven, Chestnut-backed Chickadee, Red-breasted Nuthatch, Brown Creeper, Bewick's Wren, Winter Wren, American Robin, European Starling, Orange-crowned Warbler, Western Tanager, Spotted Towhee, Song Sparrow, American Goldfinch. Eighty Bonaparte's Gulls, six Mew Gulls and Least and Western Sandpipers were seen at Pebble Beach near Columbia Beach at French Creek. An adult Little Stint was seen in with 200 to 300 peeps including-- Western Sandpipers, Least Sandpipers, Semipalmated Sandpipers, three Greater Yellowlegs, twelve Long-billed and Short-billed Dowitchers, at the San Juan River Estuary near Port Renfrew on the west coast of Vancouver Island. The Little Stint is a Eurasian species which winters in Africa and Asia and is a vagrant, casual visitor on the west coast of British Columbia. Eighteen California Quail were counted in a yard in the 2100 block of Wren Place in Nanaimo. 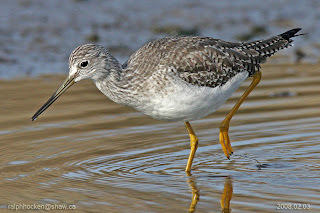 A Lesser Yellowlegs was seen at French Creek. A Black Swift was seen flying low over the sand traps and along the fairway, at Morningstar Golf Course off Lee Street and close to Morningstar Drive next to the pond. Cliff Swallows, Barn Swallows, a few Violet-green Swallows and a couple of Rough-winged Swallows were seen hawking insects over the pond. On the water were one Canada Geese, Mallards, Wood Ducks and one Northern Shoveller. On the far side of the pond along the shore a juvenile Spotted Sandpiper was bobbing continually as it walked along the shore. Two orange-crowned Warblers, six Cedar Waxwings and a young Western Tanager was seen in the bushes along the pond. A Spotted Sandpiper was seen off Johnstone Road at French Creek along the ocean. Along the tide line were Black-bellied Plovers, eight Western and Least Sandpipers,, a Bonaparte's Gull and Glaucous-winged Gulls. Four Anna's Hummingbirds and three Northern Flickers were visiting feeders along Lancashire Avenue in Nanaimo. Several Black Swifts were seen near Hammond Bay Road and Rutherford Road in Nanaimo. Eight Common Nighthawks, eighteen Violet-green Swallows, twenty-four Brewer's Blackbirds and thirteen American Robins were seen at Sooke. A Steller's Jay was seen in the 3200 block of Uplands Drive in Nanaimo. 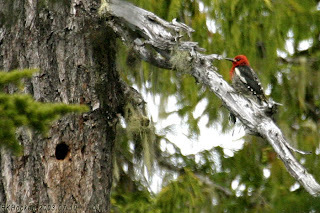 A Red Breasted Sapsucker was seen at the corner of Cavan Street and Victoria Crescent in downtown Nanaimo. A Rufous Hummingbird was observed chasing a Merlin at Fairwinds in Nanoose Bay. Five Steller's jays and a male Anna's Hummingbird were seen in a yard along Dawkins Lane in Nanaimo. A Screech owl was seen on Friday night along Rockhampton Road in Fairwinds, Nanoose Bay. The Sunday Bird Walk on August 10, 2008 will be going to the Englishman River Estuary, Plummer Road side. Meet at the Bird Store at 9:00 A.M. or at the corner of Shorewood Drive and Plummer Road at about 9:30 A.M..